A report by Rob Clark. If you’ve never been to Kieler Woche, you should…..
A fantastic venue, superb infrastructure, good and cheap food and beer, nice restaurants and hotels or cheap camping and bratwurst, plus 1,500 boats of different shapes and sizes to bring a real festival of sailing to the Baltic shores. However, above and beyond that is the sailing, with the cream of German talent (and there is lots of it) as well as a raft of international superstars to rub shoulders with on and off the race course. And so it was again in 2017, making the long drive from the UK worth every roadwork delay. 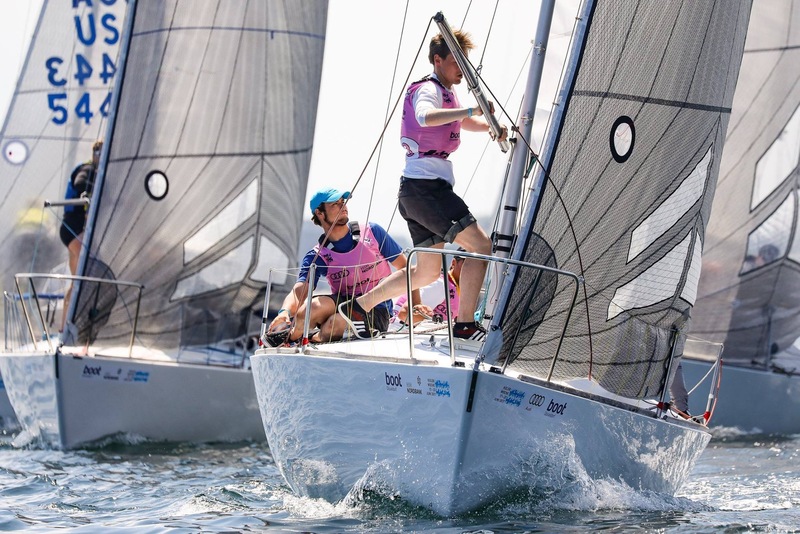 For the J/24 class this years addition featured 10 teams that had previously won a world or continental championship and several more boats that could easily be in the mix towards the latter end of the event. Pro teams, youth teams, all female teams and keen amateurs showed the diverse appeal for a design that is now 40 years old but has lost none of its challenge or competitive edge. The U.K. fleet sent 4.5 teams to Kiel, Madeleine, Jolly Roger, Phoenix, George Kennedy’s Team Impact youth team and the front half of Il Riccio, complemented by Travis and Ian from USA, who brought with them some very fine new Quantum sails for a few of us as well as some great banter on and off the water. However as soon as we hit mainland Europe trouble struck. Andy Taylor developed food poisoning from an, as yet, unidentified service station treat and Madeleine found herself, trailer and van perched on a low loader heading to a garage in Belgium. In spite of this we all made it to Germany with a day to spare and high hopes of a great regatta. That is just what we got. Multiple windward / leeward laps of a fairly short course, which we shared with another 2 fleets, meant that we had over 60 boats tussling for room and being able to pick and hold a lane with clean execution of mark roundings were vital if you weren’t to be chewed up by the very quick and slick competition – if you got clear you could get away but one mistake could throw you back deep in the pack. The following 4 days brought some incredible racing. 10 races in wind from 5 to 18 knot, swell, chop and flat water, clear blue skies and warm days. With the standard of the fleet we all knew that anything inside the top 10 was a keeper score and so it proved. The first two days belonged to Mike Ingham (USA) and Duncan McCarthy (GBR 4265) who consistently worked their way into the reckoning with great boat speed, solid decisions and impeccable boat handling. However there were a number of teams hot on their heels, with the top 10 all realistically capable of taking the event going into the second half. Day 3 brought 8 – 12 knots of wind and flat water, in these conditions every J/24 in the fleet had equal pace and height, giving us a game of snakes and ladders to negotiate with every team taking at least one high score and making things very interesting for the final act. The final day definitely belonged to Andy Taylor (GBR 4222), we finally found our mojo and counted a 1,1,2 for the day to move onto the podium. However this wasn’t enough to dislodge the Americans with Mike Ingham claiming the event and Travis Odenbach in 2nd. With 5 nations represented in the top 10, USA, GBR, GER, SWE and NED it demonstrated the true international flavour of the event. Whilst all this happened the social side wasn’t forgotten – americas cup on the big screen, beers and barbecues courtesy of the German fleet and leaping around in the main tent to United 4 – a band so wrong that makes them so right…! 1. 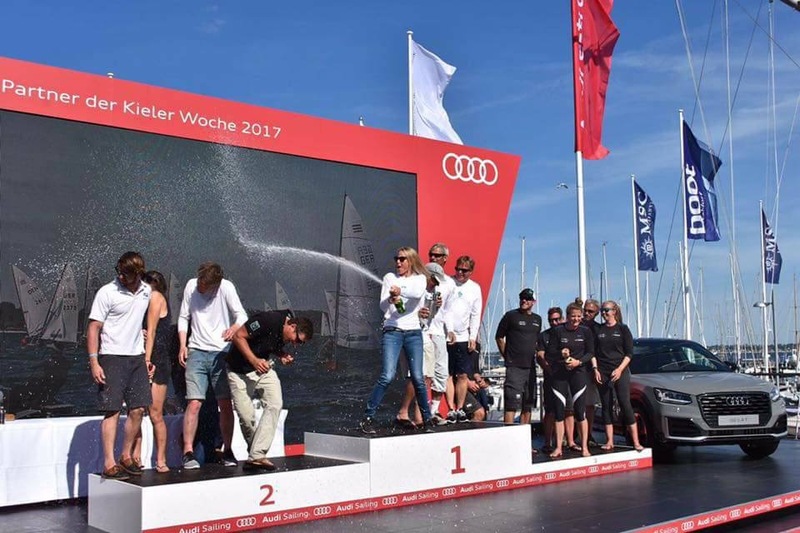 The Germans are fantastic hosts who know how to put on an event for sailors to truly enjoy. 2. If you want to develop you need to challenge yourself against the best teams and this is a brilliant opportunity to do just that – race craft comes from experience and review with your crew and other teams. 3. If you want to go quicker then chat to the top teams, they will happily help with set up, observations and methodologies – the more competitive teams we have the better the racing for all of us.